Game description: Only 22 drivers on the planet possess the talent and skill to pilot an F1 car. Are you one of them? Hungry for raw power, lightning-fast acceleration, and white-knuckle cornering? Then take a seat in the cockpit of a real F1 car and feel the rush of turning on a dime or going from 0 to 100 MPH in the time it takes you to read this line. 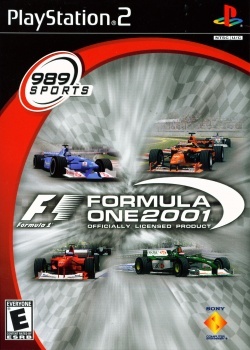 The game's "arcade" mode followed a similar line to that of Formula One 2000, although incentives were now offered in the form of upgrades to the player's car. A new mode—"Challenge" mode—was introduced. In Challenge mode, players were given a lap around Spa-Francorchamps in Jenson Button's Benetton B201. •NTSC last tested with 0.9.6 where it flooded console with 0's, unknown if working with current versions. •PAL last tested with PCSX2 0.9.2 with SPS problems, unknown if working with current versions. Hangs after choosing to start race. USA v02.20(10/02/2006), The Game Only work With the Patchs of Nachbrenner In The Game Index(Or will Hangs on Menus). Using Nachbrenner's patch(got to menu fine without it though). Launches to menus fine, menus run faster with all speedhacks off. Hangs with black screen on starting quick race. 1.5.0-20160809151530 Standard Standard FMV skip no patch no longer necessary. Auto deinterlacing makes the game look like poo Tongue Use bob tff instead. On certain camera views, there is very minor 3D glitching in the top left quadrant of the screen. Description: Game doesn't load a race, it hangs before the loading screen is supposed to show. Workaround: This has been fixed in GIT revision v1.5.0-dev-773 of May 18th, 2016. A patch is available for some very old PCSX2 versions, but it won't work with recent versions like v1.4.0. Description: In Hardware mode FMV's aren't displayed resulting in a black screen while the FMVs play. Workaround: This has been fixed in GIT revision v1.5.0-dev-615 of April 21th, 2016. In older versions temporarily switch to Software mode by pressing the F9 key to watch the FMVs. This page was last edited on 12 September 2018, at 19:15.